On the newly opened bike lane on Maritn Luther King, Jr. Way. Love me some new asphalt! The location also lets me race trains. I let them win. Not that I cheated and rode on the street before it was really, really complete or anything…. On the newly opened bike lane on Martin Luther King, Jr. Way. Love me some new asphalt! The location also lets me race trains. I let them win. 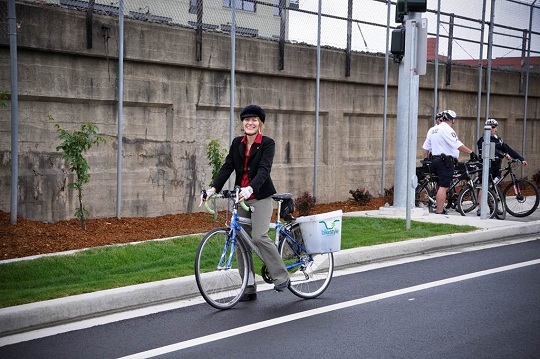 But on May 31 I had the joy of being the first rider on the officially opened Martin Luther King, Jr. Way on the south edge of the Riverpoint Campus where I work. The size of the crowd despite the pouring rain reflected the importance of dedicating a street named for Dr. King. Somewhere around 200 or so of us cheered for the dancers from Grant Elementary, clapped at the speeches, and ate tiny pecan tarts (pecan pie being a favorite of Dr. King’s). Ivan Bush and the Rev. Percy “Happy” Watkins were honored by Mayor David Condon with the keys to the city for their unflagging work in organizing the annual Martin Luther King, Jr. Unity March. The street name came as the culmination of 25+ years in advocating, pushing, cajoling, and persisting until Spokane finally named a street for Dr. King. The street is an important symbol of education and inclusion. It also represents–not symbolically but in solid concrete–the principles of complete street design that will enable safe passage of people who drive, walk, or bike through. The street features bike lanes, sidewalks, texturized and tinted concrete to make crosswalks more obvious, and right-of-way for future central city transit alternatives that might be added to today’s bus service. Its location will help route heavy truck traffic out of the center of campus to the periphery, enhancing safety for students, staff, and faculty that will improve even more when the city completes a redesign of Spokane Falls Boulevard that’s getting under way now. When the next phases of the street are extended east it will connect to the future bike/pedestrian bridge over the railroad tracks, a critical link in the bike lane/trail network that thrills me because it will cut the dangerous Sprague and Division intersection out of my daily commute route. The new Martin Luther King, Jr. Way is an extension of Riverside Avenue through the heart of downtown. I’ve ridden it both east and west several times now and it’s a joy to ride. The traffic lights on the new section detect bikes (a requirement under state law enacted in 2009 thanks to the efforts of the Bicycle Alliance of Washington), the proximity to the railroad track makes for some fun pretending I’m racing the trains that run alongside (I magnanimously allow them to win), and since Riverside through downtown has plenty of capacity with two lanes each way it’s simple enough to head into downtown to meetings and back again, sharing the street comfortably with drivers who can easily move around me–or just slow down and wait at the light since I’ll catch them there anyway. A big thank-you to the funding partners who made this street possible: Sen. Patty Murray for her leadership on the Transportation Committee, former State Sen. Chris Marr for working to obtain state dollars and the other members of the local delegation who supported it, Washington Department of Transportation for partnering, and the City of Spokane. It’s a beautiful addition to the transportation network that serves all of us. Have you ridden on it yet?